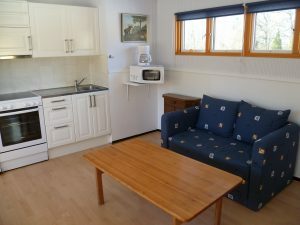 We have three types of cottages for rent, in different price categories. You will find them all below. 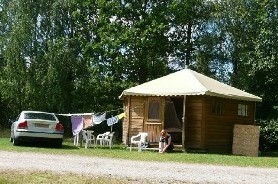 On the right from top to bottom you will find the pictures of a cottage with own toilet and shower. Suitable for 4-5 persons. This 35m2 house is fully equipped. 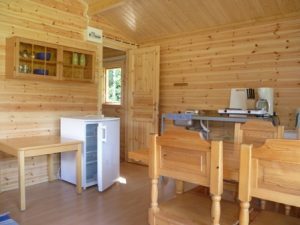 In the kitchen you will find cooking plates, fridge with freezer, coffee maker, microwave, toaster and everything you need when cooking during your vacation. 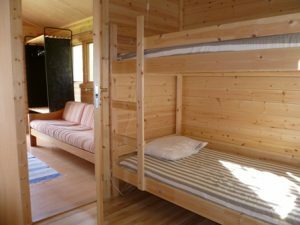 There are 2 bedrooms, each with a bunk-bed. In the living room is a sofa-bed. There is a private shower and toilet in the house. You will have to take with you your own sheets and pillow-cases (or you can rent them for kr 75,- per set). Blankets and pillows are provided. The house is well insulated and therefore a good living place in all seasons. You’ll find the prices for 2019 here. View the prices for 2019. 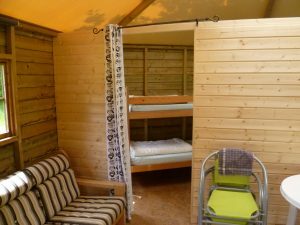 The perfect compromise between a tent and a mobile home is the cosy wooden camping bungalow, 24 m2, with a roof of canvas. 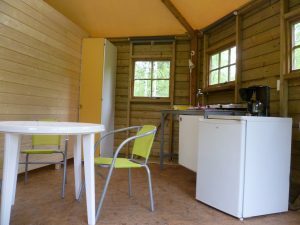 You can rent the bungalow for a (few) day(s) or for a week, even in high season. You will have to take with you your own sheets and pillow-cases. Blankets and pillows are provided.